Price Is For This Set Of Pocket Doorplates And Locks For Double Doors -The Doorplates Are Solid Stamped Brass With A Very Dark Tone / Patina -All 4 Doorplates Are Blanks /Not Keyholes -Doorplates Appx. 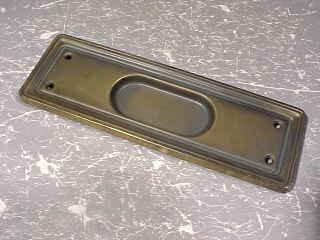 7 3/4" x 2 1/2" -Lock Faceplates Appx. 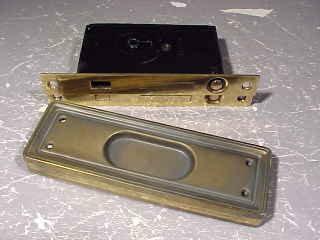 7 5/8" x 15/16 -The Lock Faceplates Are A Lighter Polished Brass Tone [Yellow Brass Tone]- Distance From The Front Of The Lock Faceplate To The Back Of The MALE Iron Lockbox Appx.4" -Distance From The Front Of The Lock Faceplate To The Back Of The FEMALE Iron Lockbox Appx. 3 3/8" -Set Does Not Have A Key [many people do not lock their pocket doors] - This Is A Nice Double Door, Pocket Doorset - Please Email Or Call Us For Shipping Cost, Before Submitting Payment - Purchaser Pays Shipping.